Since the Houston Bike Plan’s adoption in March 2017, we have been working to implement the Plan’s vision to make Houston a safer, more accessible, Gold-level bike-friendly City. To get there, implementation will take the form of addressing the 5 E’s: Engineering, Education, Encouragement, Enforcement and Evaluation. View Year One Accomplishments here! 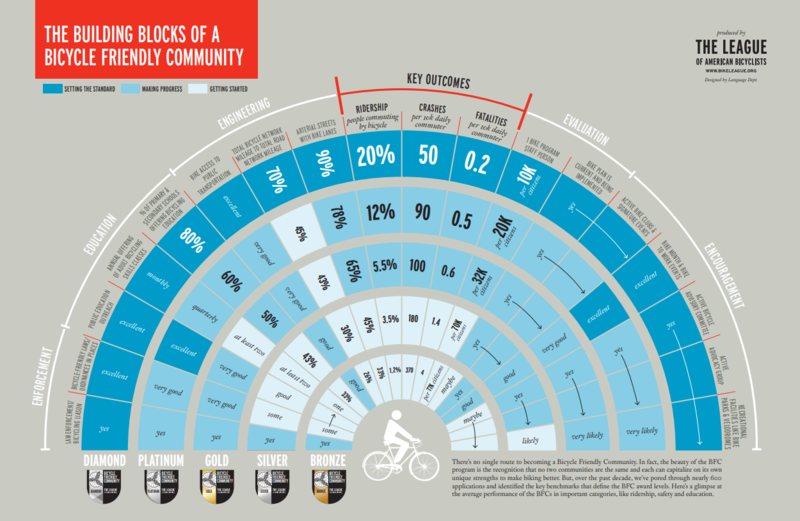 A major component to implementation is building a network of high-comfort bikeways. Building on the significant public input provided during the Bike Plan process, the City is committed to engaging communities and stakeholders as we prioritize, select and design bike facilities from the Plan. Engineering and construction of final designs will happen only after thorough analysis and public engagement. Visit our Engineering page to learn more about current projects. Where would you like to see new bike infrastructure? Email us at bikeways@houstontx.gov. There are a variety of ways to learn how to ride a bike safely in Houston. Learn to Ride classes are hosted every weekend open to BikeHouston members, including children of all ages. The League of American Bicyclists Smart Cycling program has videos and other online bicycle education materials. BikeHouston has also begun a Bicycle Friendly Driver education program, which consists of a 90-minute interactive course taught by specially trained Bicycle Ambassadors to educate drivers on the best and safest ways to share the road with people on bicycles. Become a Sponsor! 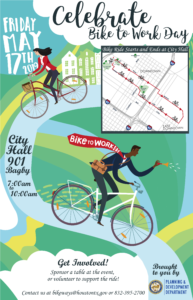 Our event is growing annually and the Houston Bikeways Program is always looking for support! Please send all inquiries to bikeways@houstontx.gov with the subject heading “BTWD Sponsor Request”. Volunteer! Become a Bike Wrangler or event volunteer by sending an email to bikeways@houstontx.gov with the subject heading “Bike Volunteer Request”. Houston is home to a vibrant social bike riding scene with nearly daily bike rides throughout the city – from high-speed training rides to the casual Tour de Taco. Find out more here. The Mayor’s Office of Special Events maintains a calendar of events, some of which are bike-related. The City of Houston adopted a Vulnerable Road User Ordinance in 2013. Houston Police Department released a Public Service Announcement about the ordinance. HPD also regularly conducts stings on roadways to enforce 3 feet of space between a driver and a cyclist for passenger vehicles and 6 feet of space for commercial vehicles. In 2014, Mayor Parker launched the Goal Zero Fatalities safety campaign that focused on eliminating cyclist fatalities in Houston. Starting in 2019, biennial reports on Bike Plan implementation will be posted here.